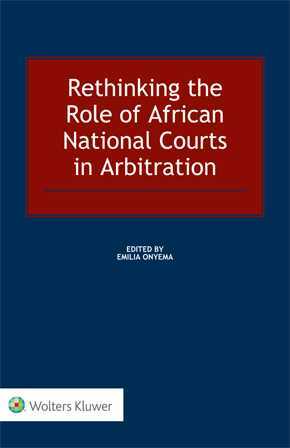 Rethinking the Role of African National Courts in Arbitration provides a remarkably thorough overview of the relation of courts and arbitration in the African continent. This book documents the Second SOAS Arbitration in Africa Conference held in Lagos in June 2016. With the increase in commercial transactions, both within the fifty-four independent African States and at international level, it has become apparent that most of the legal framework for arbitration across the continent requires reform. Accordingly, in recent years, as this first in-depth treatment of arbitration in Africa shows, jurisprudence from national courts of various African jurisdictions demonstrates that the courts are becoming more pro-arbitration and judges increasingly understand that their role is to support or complement the arbitral process. how foreign courts (particularly in the United States, France, and Switzerland) perceive African arbitration. This book discusses the wide range of developmental stages among Africa’s court and legal systems in two parts: Part I explores generic issues relevant to courts and arbitration; and Part II provides detailed descriptions, including court decisions, of the situation in eight specific jurisdictions – Egypt, South Africa, Sudan, Mauritius, Nigeria, Ghana, Rwanda, and Kenya. The authors of these latter chapters are legal practitioners and academics from each of these countries. Throughout this book, policy recommendations for improving access to court decisions and laws in the African States are brought to the fore. In its expertise-based advocacy for a mutually harmonious and supportive coexistence for arbitration and litigation in the context of the complexities and peculiarities of African States – and its confrontation of the predominantly negative perception that often leads to ‘arbitration flight’ from the continent – this book helps companies, investors, and their advisors to base their decisions on facts and not perceptions. It is of great value to practising lawyers in arbitration as counsel or arbitrators, companies doing transnational business, global law firms, government officials, and academics in the field.